Although fungal infections of the skin are very common, there are some areas of the body where it is not frequently seen. The mustache and beard area is one such instance. However, fungi may infect the skin and hair in this areas in a similar way as it can infect the scalp. 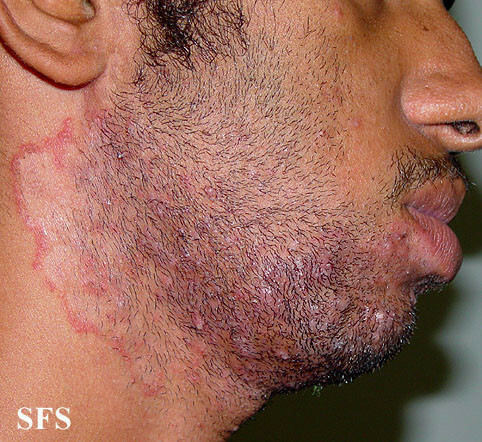 Tinea barbae is the medical term for a fungal infection of the skin and hair in the bearded area. This means it affects the bottom part of the face and may extend to the neck. A fungal infection of the skin on the face is known as tinea faciei and there is some degree of overlap in these medical terms. However, tinea barbae is usually exclusively referring to a fungal infection on the bearded area in males, particularly older adolescents and adult males. Overall tinea barbae is an uncommon fungal skin infection. Although tinea barbae may be seen throughout the world, it has become uncommon these days with modern day hygiene practices. Tinea barbae should not be confused with folliculitis – an infection of the hair follicles usually due to bacteria. While folliculitis can superimpose and existing beard fungus, these two infectious conditions are separate conditions. Tinea barbae is also known as barber’s itch because it was mainly transmitted during shaving with shared razors by barbers and the resulting skin rash is itchy. The type of fungi that causes this infection is known as dermatophytes. These fungi are very common and distributed throughout the globe. It is the same type of fungi that causes jock itch (tinea cruris), a fungal infection of the groin, and athlete’s foot (tinea pedis), a fungal infection of the foot. Dermatophytes have specialized enzymes that can digest keratin, the protein that makes the outer lying layers of skin tough. Hair and nails are also composed of keratin. Dermatophyte infections are usually superficial meaning that it does not extend beyond the outermost layer of the skin. However, there may be severe reactions at the site as the body responds to the presence of the fungi and a secondary bacterial infection may occur as well. The more likely fungal species to cause tinea barbae is may vary according to geographical location, close contact with animals and even climatic and lifestyle factors. Sometimes tinea barbae can be asymptomatic (without symptoms) in very mild cases. At other times there may only be itching without any clearly visible rash. Although the term beard is used, tinea barbae can also involve the mustache area. It is more commonly seen on the chin and neck from where it may then spread. Dermatophyte infections are also commonly referred to as ringworm because it causes a characteristic red ring-like lesion. However, this may not always be evident. 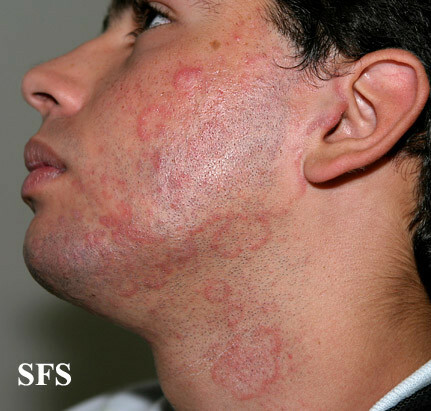 Tinea barbae skin lesions can be characterized as inflammatory or non-inflammatory. The inflammatory lesions are typically red, there may be swelling of the skin and nodules on the skin with oozing discharge. There may also be pain. Non-inflammatory appears appears less red and swollen, and usually there are no nodules present. Hair loss in the affected area is common. Itchiness of the skin is common and may vary in intensity. Hairy areas affected with a fungal infection may develop kerions. These are spongy masses covered with pustules and are usually painful. It is mainly seen with tinea capitis (scalp ringworm) and tinea barbae (beard ringworm). Although it may be severe, kerions are usually not painful or itchy as would be expected. Some of the images of beard fungus may not be suitable for sensitive viewers. Images sourced from Dermatology Atlas Brazil (atlasdermatologico.com.br). Tinea barbae is treated in a similar manner to tinea capitis (scalp ringworm). It involves removing hair in the area and using topical antifungals. While topical agents may suffice for most mild to moderate dermatophyte infections, with tinea babae there is also the need for oral antifungal agents. These drugs must be used for 4 to 6 weeks for the infection to be totally eradicated. Preventative measures need to be implemented to avoid a recurrence. Sometimes antibacterial applications and antibiotics may first need to be used before the treatment against the fungi is commenced. It is important to do so before even shaving off any remaining hair. Shaving over a kerion can be difficult and cause skin damage, possibly even with scarring in the long term. Although uncommon these days, tinea barbae may still be present and even endemic in certain areas of the world. A few simple measures can help with prevention. Always use a clean razor to shave the bearded area. Never share razors and ensure that barbers are using new clean blades when shaving the area. Be careful about sharing personal items like towels with a person who has tinea barbae. 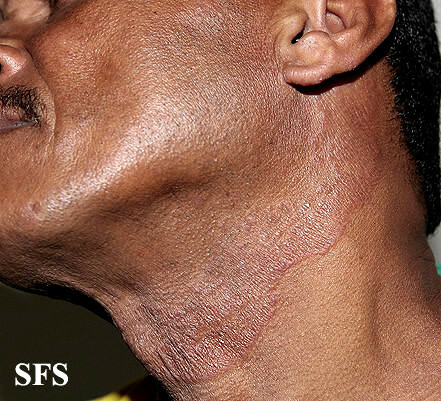 The fungi can be spread especially after shaving when tiny cuts in the skin can allow fungi to enter. Remove facial hair if tinea barbae is a problem. Remember that the hair must only be used with a clean razor. Hair removal with other methods is less likely to lead to tinea barbae. Try not to touch the face after touching animals without first washing the hands thoroughly. People who are prone to tinea barbae should be more cautious in this regard. Ensure that fungal infections elsewhere on the body, like the scalp, groin or feet, is properly treated and eradicated to prevent cross infection between these areas and the beard area (autoinnoculation). Use an antimicrobial application to disinfect the area after shaving. Also ensure that the skin is properly moisturized for optimal health.